Akira Kurosawa is one of the most significant directors in cinematic history. Kagemusha (1980) and Ran (1985) count amongst the most important films of his late period: epic in nature, thematically similar to yet different from Shakespearean dramas, and with an aesthetic power that gains in tension from the interplay of staid imagery and dynamic motion. Kurosawa is both a film-maker and painter. He is influenced by traditional Japanese painting and European styles, such as Impressionism and Expressionism. The idea of the film came to him by chance as he failed the admission test to art college and ended up working as an occasional painter and graphical artist in the late 1920s and early 30s to make ends meet (see Stafford 2010, 1). Kurosawa’s greatest post-WWII successes were Rashomon (1950) and Seven Samurai (1952). After the debacle of his collaboration in the Pearl Harbour film, Tora! Tora! Tora! (1970) which, despite two years’ work, produced no useable material, it all went quiet for Kurosawa. He had major problems financing further films and suffered health issues. He presented his Kagemusha idea to the Japanese production company Toho in 1977, including the estimated production costs, but it was rejected. Forty years after beginning his cinematic career and leaving the field of painting, he once again picked up the brush. 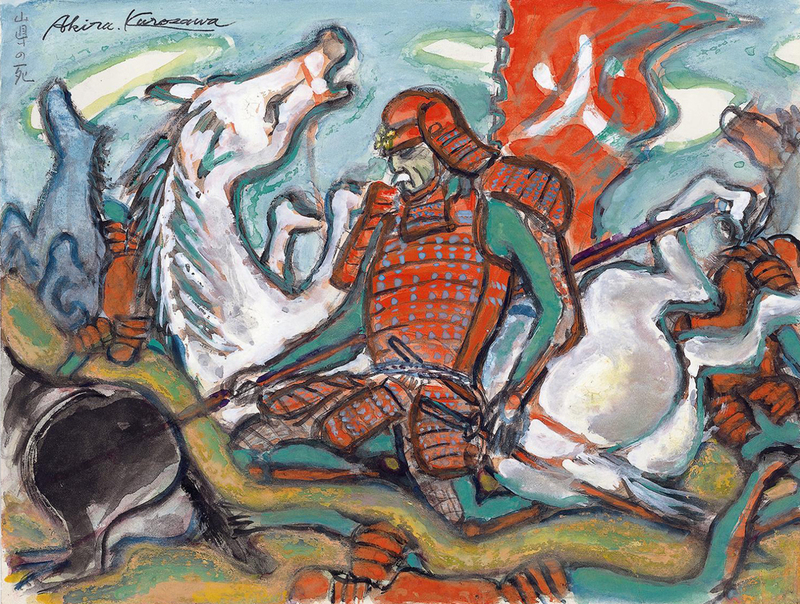 With chalk, aquarelle, gouache and sumi, he composed several hundred drawing and sketches to convey the intended visual impact of Kagemusha (Richie 1980, 204). Kurosawa in the end created an entire storyboard for a film he thought would never be realised. The sketches show detailed depictions of individual settings and also conveyed a sense of the overall look he had intended for the film. Donald Richie wrote that at this point, the ideal film had already been created, without any of it actually having been produced at the time (Richie 1980, 204). Once Kurosawa had secured financing for the film with the help of Francis Ford Coppola and George Lucas in the late 1970s, these artworks formed a complete compendium for how the film should be realised visually. The closing sequence – the complete destruction of the Takeda clan – is played out with next to no dialogue at all. First, the opponents of the Takeda clan learn that their Lord Nobukado is dead and his doppelgänger is exposed. Katsuyori, the actual leader of the Takeda clan orders an attack against Leyasu and Nobunaga’s troops. 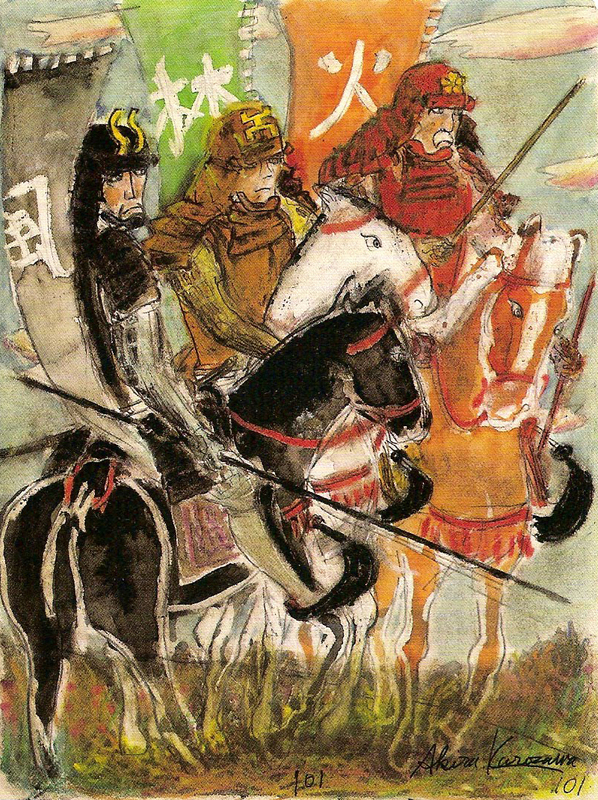 The three generals of the Takeda clan gather their soldiers under the banners of wind, forest and fire, characterised by the colours black, green and red. Richie, Donald: The Films of Akira Kurosawa. Berkeley / Los Angeles / London 1996 (3rd ed.). Stafford, Roy: Kurosawa: Master of World Cinema. Bradford 2010.